While I am thrilled with the continued movement of MDMA and other psychedelics towards social and political acceptance as therapeutic tools, the fact that this is mainly aimed at bringing soldiers to an inward acceptance of the hurt they gathered… and in some case, inflicted… in one of America’s perpetual overseas adventures raises some deep political questions. Not that I would deny our “wounded warriors” relief. They are not to blame for the poor choices of our political leaders. But it does raise the question whether — in a broader philosophical and political sense — we want the burden of going to war to be lightened and to what degree. It also implies the potential for a drug that makes us calmly transcendent and all self-forgiving even in the act of war. This is, indeed, one of the conditions the military is looking to create for its supersoldiers. The following entry is from the early part of the MONDO 2000 story, when “Somerset Mau Mau” and I were distributing the first newsprint edition of High Frontiers, the magazine that became MONDO. A few weeks after publication, Bruce Eisner said that we really needed to hustle down to his and Peter’s hometown of Santa Cruz because there weren’t any copies available in the stores and people had already grabbed the few we had sent them for free. Also, it would be good to meet the folks in the Santa Cruz psychedelic community. We were invited to stay at Peter Stafford’s apartment. We arrived at Peter’s place, overlooking the Pacific Ocean. Entering a spacious two-room apartment with high ceilings and sunlight streaming in through huge picture windows, Eisner greeted us in the living room. Meanwhile, behind closed doors, there seemed to be a mild hubbub going on. We stood making small talk with Bruce as the door to this other room — it soon became clear it was a bedroom — would quickly open and close. Eventually the door opened and we could see a bunch of guys in a sort of ill-formed circle around the very tall Peter Stafford, so that we could just see his naked chest, goofy grinning laughing face and wildly flailing arms. Everybody seemed to be arguing with Peter. Bruce sighed. “Peter likes to get naked when he’s high,” he said. We assured Bruce that we had no problems with anybody greeting us naked. Eventually, Stafford apparently compromised with his friends and came out to great us wearing a pair of white undies. 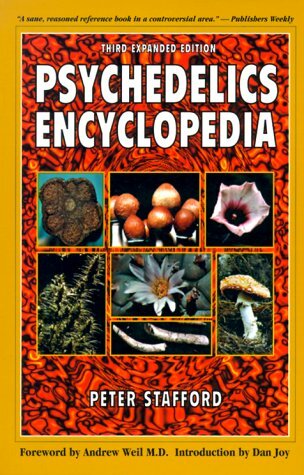 We immediately fell into a rapture with Peter, as he excitedly ran us through a full course in his personal psychedelic history; tossing books he’d written or that he was mentioned in at us and waxing mega-enthusiastic — as I recall — about squeezing mescaline from a cactus among many other trippy matters. And then the party began. As I recall, it was just drink and powerful weed. So the next few days were a blur of way-stoned, half-drunk but absolutely lucid lessons in drug history and psychopharmacology as preached by Peter, interrupted by brief forays around Santa Cruz to meet the local heads. Most impressive were two older women, probably in their ’60s or ’70s. Nina Graboi lived in a neatly furnished modest but brightly colored apartment with huichol peyote paintings on the wall. She had been the New York Director for the League of Spiritual Discovery (LSD), Timothy Leary’s earliest attempt at organizing to educate psychedelic explorers and defend their rights to trip. She had also worked with the legendary LSD psychotherapist Stan Grof. Mau Mau and I felt ourselves in the presence of deep psychedelic history. The other elder was Liz Gips — a funky gal in baggy blue jeans who seemed to have the hint of a southern accent. I remember being very impressed with her intellect as she laid out the Santa Cruz psychoactive scene and told us about the radio show she hosted on a local public radio station. She invited us to come on her show to talk about High Frontiers a couple of days hence. We’re inured to it now — even those of us who remember a time when weirdo rock music, even of the most commercially popular sort, wasn’t used in television advertisement. But every once in awhile, there is an odd or interesting enough juxtaposition of the content of the song to the company being advertised… or even just to the fact that someone deemed this appropriate to be part of an ad, that it makes me, at least, sit up and take notice (and wonder why no one else ever seems to). The first big fuss, way back, was about The Beatles song Revolution being used in an ad for Nike (the song was owned by Michael Jackson) in 1987. Revolution wasn’t a particularly revolutionary song (“Don’t you know it’s going to be all right?”), but McCartney made some unhappy noises about its use (Lennon being unavailable). McCartney’s songs have since been in a number of ads. A stranger note was stuck by the use of the Jefferson Airplane’s Yippie-esque marching song, Volunteers in an E*Trade ad, which I think may have been aired in the late ’90s, if memory serves, or it may have been later. Iggy Pop’s Lust For Life to advertise Royal Caribbean Cruise was pretty strange if you know the lyrics, but in contrast with Volunteers, the songs’ more radical or distinctive lyrics weren’t a part of the ad. The truly weirdest thing I ever saw mixing rock with advertising was — I swear to my own memory of this — a Goodyear Tires ad using Venus In Furs by the Velvet Underground. Now, I find on YouTube only a Dunlop ad from Great Britain, which is peculiar enough, but this ad is visually strange whereas the Goodyear ad was visually straightforward, and therefor did not call any attention to the content of the song. I saw it once and never again. So there’s the contemporary anticolonial war undercurrent (we naturally think of western soldiers in Arabic territories), but what really sticks out like a sore thumb with a tab of ecstasy on it is the well enunciated “I’d Rather Be High.” The French Revolution-era Court of Louis XVI party decadence visuals are just there. Interesting, but more Louis Vuitton than I’d rather be high. But then, at the end, the fashionable and contemporary beauty — model Arizona Muse sitting at the piano gazes up rapturously at the Michaelangeloesque ceiling, reaches slowly — as though, in fact, high, slightly out-of-body, for her fashionable LV pocketbook and then, outdoors, gazes at the camera with eyes that seem, well, high in a psychedelic sense, a bit like she’s seeing you better than you’re seeing her, and maybe having casually drifted up to that Michaelangelesque ceiling, she’s now a tad the chic urban visionary, and at the same time she’s not experiencing quite enough boundary between her self, the camera and whatever’s behind it. What’s interesting here isn’t any residual purity anyone may have about rock in advertising. That ship sailed long ago. What’s interesting is the conflation of being high… on drugs… with the desired product. Which has been done over and over again for years, but never enunciated, clearly, lyrically, until now. So that’s it then. A cultural watershed? Wanting to be high… even being high… it’s normal as wanting to be chic, which is… how normal? Not sure. But the whole negotiation around drugs, their legalization, their use, and maybe even the more liminal states that some of them sometimes provide are coming into the open. Maybe? In most peculiar ways. To wit: the clever, logical, programming/engineering monkey-mind should not be allowed to instantiate its limited idea of humanity, the universe and everything, on… well… humanity, the universe and everything. It was at the end of the first day of the Singularity Summit 2012 when Ben Popper — the dude from The Verge who I’d spoken to by phone approached. “What do you think?” he asked. It’s been pretty interesting, I responded earnestly. The absence of a superlative was perhaps telling, but I was not in the mood to think on it more deeply. Ben agreed. And then Eve and I made a wrong turn heading back to the North Bay and we found ourselves moving at a crawl through Chinatown. Chinatown was throbbing with biological life of the human sort. Old Chinese women were inspecting vegetables on display outside of stores. A group of older men stood on a street corner just hanging out and talking. The streets were packed to overflow with people going about their early Saturday evening activities. I don’t think I saw anybody smiling, but I had the sense that people were enjoying their familiar activities. Once home, I decided to finally watch I’m Still Here, the Casey Affleck film documenting Joaquin Phoenix supposed attempt to leave behind his acting career to become a rap star. Fat; with long uncombed hair and scraggly beard, dressed like a particularly disheveled street person — throughout the film, Phoenix, along with some of his handlers, displays a full repertoire of coarse, vulgar, moronic human behaviors as he tries to pursue his new career. He also appears in onstage performances, rapping… badly. Various media commentators suspect that it’s a hoax, but Phoenix remains in character. He puts Ben Stiller — trying to get Phoenix to consider a script — through the ringer. He acts pathetic and nuts in a famous Letterman appearance. He’s trying to get Sean Combs to produce a rap album for him.